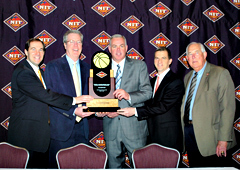 Iowa coach Fran McCaffery (2nd from left) holds the championship trophy with other NIT coaches. The Iowa Hawkeyes are headed to the championship game of the NIT. Eric May’s 3-pointer with just under a minute remaining sealed a 71-60 victory over Maryland in New York’s Madison Square Garden. May says he was “feeling it” when he hit the late three pointer and he knew it was going in when it left his hand. Iowa’s zone defense slowed down Maryland and the Hawkeyes led virtually the entire game. “We stuck with it, this team is unbelievable… these guys are good the team we just beat,” May says. The difference in the game was points off turnovers, the Hawks finished with 27 and the Terrapins only two. The Hawkeyes also played well in their halfcourt offense. May says they had a lot of good play calls and were disciplined and stayed locked in to running the plays correctly the whole game. Iowa coach Fran McCaffery says it was only fitting that May hit the shot that put the game away. “He’s been playing like that all year long,” McCaffery says. He says he kept looking for a time to take May out of the game, but he was playing so well, he decided not to. May finished with 12 points, four rebounds, five assists and three steals. Junior guard Roy Devyn Marble had another big game. Marble scored 21 points and added nine rebounds. McCaffery says Marble had to deal with their changing offensive sets and he was able to handle the press down the stretch. Iowa improves to 25-12 and will play Baylor in Thursday night’s NIT championship game. The Bears topped BYU 76-70 in the other semifinal round game.